Department of Economic Affairs, Ministry of Finance releases Quarterly Statistics on India’s External Debt for the Quarters at end-September 2016; India’s External Debt at end-September 2016 stock stood at US$ 484.3 billion, recording a decline of US$ 0.8 billion (0.2 per cent) over the level at end-March 2016. As per the standard practice, India’s external debt data are disseminated on a quarterly basis with a lag of one quarter. Statistics for the first two quarters of the calendar year (ending March and June) are compiled and released by the Reserve Bank of India, while the data for the last two quarters (ending September and December) are compiled and released by the Ministry of Finance, Government of India. In addition, Government of India brings out an Annual Status Report on External Debt that contains detailed analysis of external debt position of the country. The major developments relating to India’s external debt at end-September 2016 are presented below. (i) At end-September 2016, India’s external debt stock stood at US$ 484.3 billion, recording a decline of US$ 0.8 billion (0.2 per cent) over the level at end-March 2016. The fall in external debt during the period was due to commercial borrowings and short term external debt. However, on a sequential basis, total external debt at end-September 2016 increased by US$ 4,768 million from the end-June 2016 level. 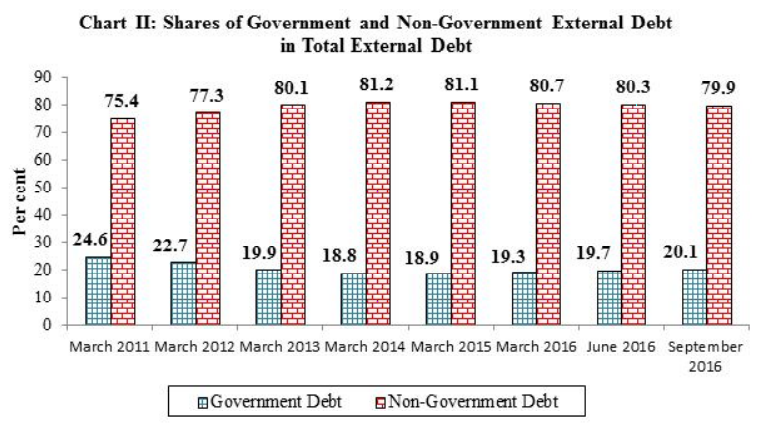 (ii) The maturity pattern of India’s external debt indicates dominance of long-term borrowings. At end-September 2016, long-term external debt accounted for 83.2 per cent of India’s total external debt, while the remaining (16.8 per cent) was short-term external debt. (iii) Long-term debt at end-September 2016 was placed at US$ 403.1 billion, showing an increase of US$ 1.4 billion (0.4 per cent) over the level at end-March 2016. Short-term external debt witnessed a decline of 2.6 per cent and stood at US$ 81.2 billion at end-September 2016. (iv) Valuation loss (depreciation of US dollar against the Indian rupee and most other major currencies) was placed at US$ 1.0 billion. This implies that excluding the valuation effect, the decrease in debt would have been higher by US$ 1.8 billion at end-September 2016 over the end-March 2016 level. (v) The shares of Government (Sovereign) and non-Government debt in the total external debt were 20.1 per cent and 79.9 per cent respectively, at end-September 2016. (vi) US dollar denominated debt accounted for 55.6 per cent of India’s total external debt at end-September 2016, followed by Indian rupee (30.1 per cent), SDR (5.8 per cent), Japanese Yen (4.8 per cent) Pound Sterling (0.7 per cent), Euro (2.4 per cent) and others (0.6 per cent). (vii) The ratio of short-term external debt by original maturity to foreign exchange reserves stood at 21.8 per cent at end-September 2016 lower than the 22.6 per cent at end June 2016 and 23.1 per cent at end-March 2016. (viii) On a residual maturity basis, short-term debt constituted 42.0 per cent of total external debt at end-September 2016 (42.4 per cent at end-June 2016 and 42.6 per cent at end-March 2016) and stood at 54.7 per cent of total foreign exchange reserves (55.9 per cent at end-June 2016 and 57.4 per cent at end-March 2016). (ix) The ratio of concessional debt to total external debt was 9.4 per cent at end-September 2016, same as at end-June 2016 and a marginal increase from the 9.0 per cent at end-March 2016. 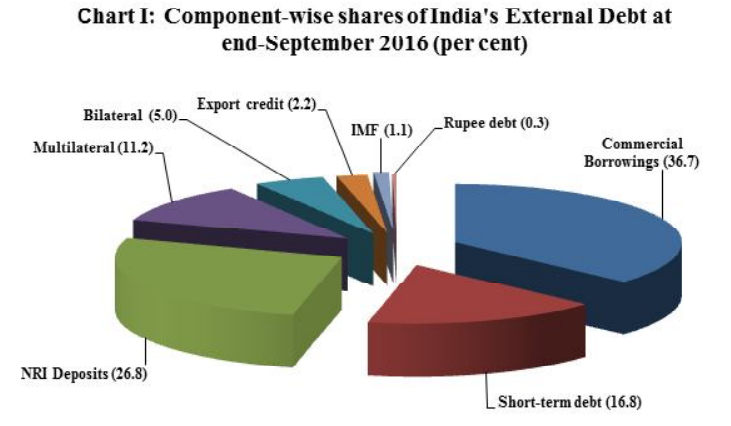 The complete quarterly report of India’s external debt at end-September 2016 is available on the website of Department of Economic Affairs.